Greetings and salutations True Believers and welcome to another installment of State of the Marvel Universe. For those of you joining us for the first time, I will be acting as your very own Secret Wars correspondent reporting all the latest additions and changes to Marvel’s ever expanding roster of post incursion titles to be included in the status quo obliterating crossover event beginning in May and the resulting fallout of these changes. Sound like a pretty tall order? Well believe me it is. It seems like every day there are several new titles to report as well as a voluminous amount of other Secret Wars related items. This week is no exception; with the big event just around the corner Marvel has been diligently announcing limited and on-going series that will be released as part of the over-arching Secret Wars event under one of the three subdivisions, Battleworld, Warzones and Last Days depending on where each particular series fits into the timeline or setting of the overall event arc. These articles are designed to illuminate the terrain a bit as far as titles, creative teams and publication dates; as B&B’s resident Agent M I will be doing my best to handle the daunting task of delivering all the news from the House of Ideas as I get it. 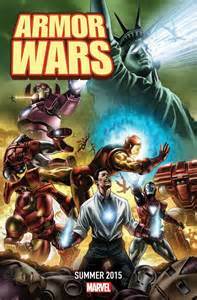 So without further delay let’s jump into the next round of Secret Wars titles beginning with Armor Wars. Coming to us from the minds of writer James Robinson fresh from his series ending run on Fantastic Four and artist Marco Takara, Armor Wars will carry the Warzones brand. Spinning out of the classic 80’s Iron Man story arc this title will offer a new perspective on a familiar plot. Set in the Battleworld domain of Technopolis where disease has forced all the inhabitants to don suits of Iron Man style armor which Tony and his brother Arno Stark manufacture. Although the Starks are rivals in the armor business, the brothers must come together to solve a mysterious murder. The series will also feature several other Marvel characters in Stark style armor including the former War Machine, James “Rhodey” Rhodes donning the armor this time as Thor. In an interview with Comics Alliance, Robinson explained why he decided to go with a murder mystery to tell this particular story. 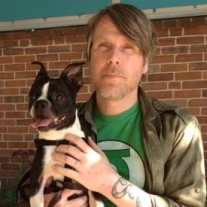 “I just wanted to give the readers something they might not expect. Don’t worry there will always be a big armor war in each issue, but I love crime fiction, so the idea of making this series a murder mystery where it’s the solving of the crime that leads to so much action is, I think, a novel twist.” It Kind of sounds like he has taken a page from Jason Aaron’s Original Sin playbook, but that’s fine with me because I absolutely loved that story. We will see when the mystery unfolds this summer; Armor Wars will be out in June 2015. Also scheduled for a June 2015 release is the unlikely sounding Mrs. Deadpool and the Howling Commandos. Once again the prolific Gerry Duggan takes on the mythology of Deadpool, although this time around it is the mouthy merc’s better half taking center stage, since DP is or will be at the time this first issue hits the racks, for all intents and purposes deceased. Duggan has become, in my opinion, the definitive Deadpool writer, his work with co-writer Brian Posehn on the character’s eponymous series has become the seminal work in Deadpool’s illustrious history. 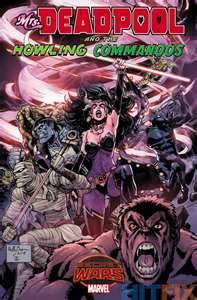 Wade Wilson’s bride, the vampire queen Shiklah will be leading a monster team of Howling Commandos featuring Werewolf by Night, Frankenstein and the Living Mummy in this horror themed series. And since we all know you can’t keep a good man down, Duggan has said that Deadpool will be involved albeit in “an unexpected way.” He went on to explain, “We’re almost sort of rewinding a little bit to Shiklah and Deadpool’s first meeting. It turned out a little bit different on Battleworld than it did in the main universe. It’s a spiritual successor to the Gauntlet arc, but it’s a little more madcap and fun I hope than some of our recent more serious Deadpool stories. I think anyone that liked the Gauntlet will have a lot of fun here.” And who among us didn’t have a blast reading that story of moonlight, love and vampires featuring the Regeneratin’ degenerate himself. Mrs. Deadpool and the Howling Commandos is sure to be hit with anyone considering themselves a fan of the DP Man. The final book we are going to look at in this installment of SMU comes to us from the big, beautiful brain of Brian Michael Bendis, The BoMB baby! 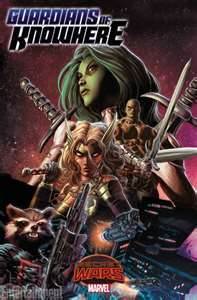 And artist extraordinaire Mike Deodato, Jr ;featuring the Guardians of the Galaxy and falling under the Warzones banner Guardians of Knowhere will be on the racks in June. This limited series seems to be what will be replacing the monthly GotG title during the Secret Wars event. In this story, the floating head of a celestial that has served as a space station known as Knowhere now serves as Battleworld’s moon. The rest of the Marvel universe may have been destroyed but there are still places that need heroes; Knowhere is a world full of criminals, convicts, thieves, thugs and killers of every kind, however hope is undefeatable. The Guardians of Knowhere stand as protectors to those who cannot protect themselves, but a new villain stalks the shadowy corners and darkened alleyways of this orbiting fortress thousands of miles above Battleworld and this sinister foe has set his deadly aim on the Guardians of Knowhere. Who is this menacing marauder? And who will survive his murderous intentions? While the entire current cast of GotG will appear in this series, Drax and Gamora with serve as the central characters in the narrative. Utilizing murder mystery tropes in crafting this story, Bendis tells Entertainment Weekly, “We’re gonna open up on a mystery in Knowhere and that mystery is going to open up a lot of stuff- including a new villain. Characters a lot of people have been asking for show up and by the end of the series you’re going to see a status quo change that I think people are going to be very excited about.” As far as the fans and their fears of just exactly how Secret Wars will affect the Marvel universe, BMB said, “Yes, it’s very scary- what will the Marvel Universe be when this is all done? The best series being done during this- and all the ones I’m attempting- are going to bring something into the Marvel Universe that wasn’t there before. And this one will absolutely be doing that. There will be a fundamental change in the Guardians coming out of Secret Wars that I think is going to [lead to] a nice conversation for people to have afterwards.” And that is straight from the mouth of the BoMB baby! Well that is going to bring us to the end of another installment of The State of the Marvel Universe with Shawn Warner aka B&B’S man in the battlefield of Secret Wars. Please come on back next time True Believers when we will focus our attention on Captain Marvel and see what Carol Danvers is going to be up during the tumult of Secret Wars, then we check out the Squadron Sinister and pay a visit to those uncanny mutants in the Years of Future Past. All that and much more next time in SMU at B&B, Excelsior! This entry was posted in comic book news, Comic Book Reviews, comic books, Comics Column, marvel comics, secret wars, The Marvel Universe and tagged comic book news, comic book reviews, comic books, Comics Column, Marvel Universe, secret wars. Bookmark the permalink.